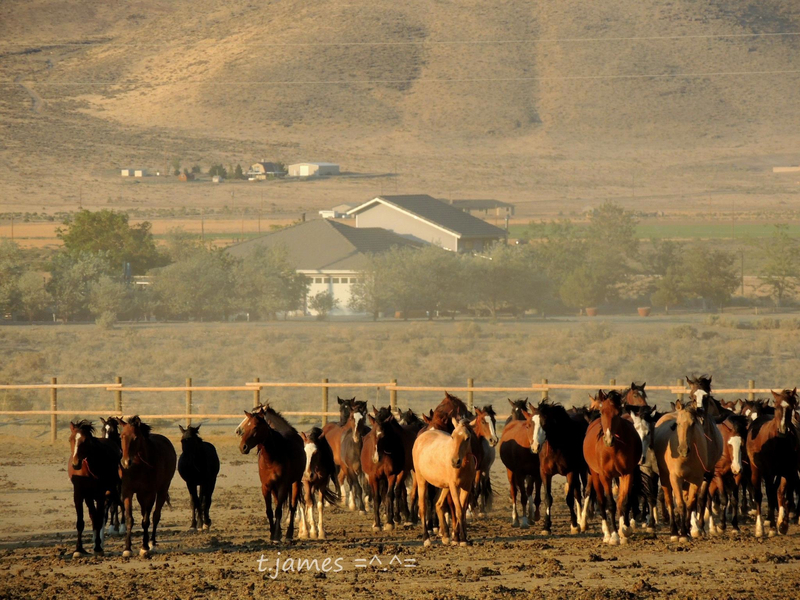 Will an open gate be adequate for wild horses and burros to pass through in a panic? How long are the gates? What about all the fenced off acreage? How tall are most of the barbed wire fences? We ask the BLM to take down fencing to ensure wild horses and burros will not be trapped and be able to escape to safety. How many wild horses and burros are left in the HMA right now? 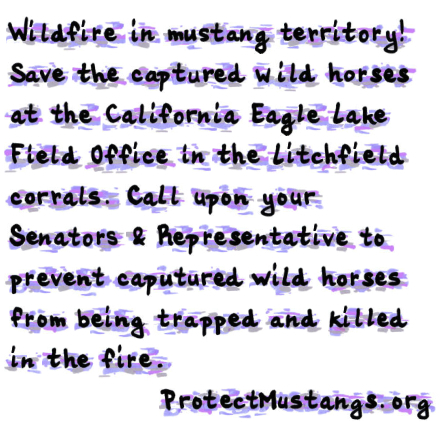 Please send me a PDF of the BLM’s order to ranchers as well as the order to fire crews to leave the gates open for the wild horses and burros passage to survive during the wildfire. We would like to be updated regarding sightings of wild horses and burros with specifics on location and headcount. Besides ranching what other multiple use is present on the Twin Peaks HMA? 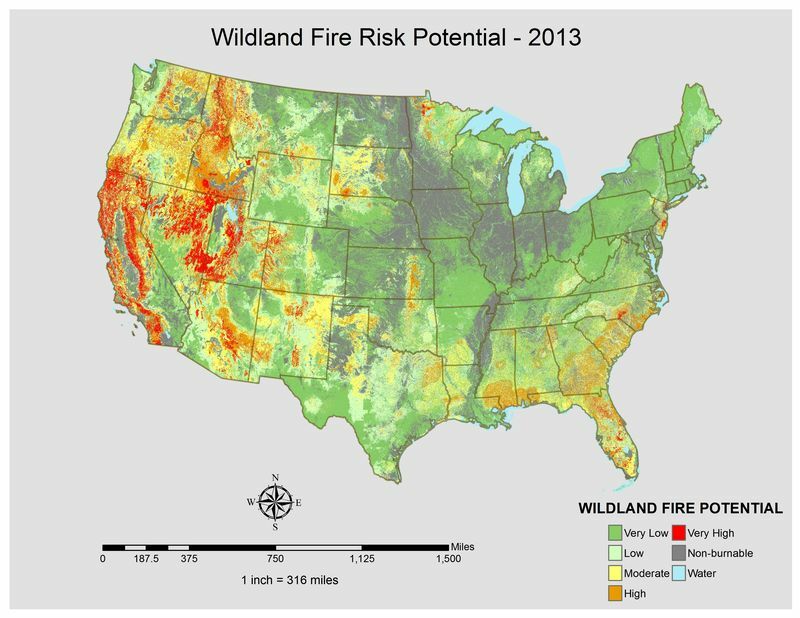 Will the wildfire be coming close to energy and or mining projects and therefore cause environmental pollution? How will this be mitigated? Thank you for your kind assistance and your help to ensure wild horses and burros will be able to escape the fire. Sorry for delay. Rush fire has been demanding. It is unprecedented up here in size and extreme behavior. As of Friday, Aug. 17, there have been no sightings of injured or deceased mustangs or burros. A group of burros has been seen in an area that had been burned earlier during the fire, and they are safe. Observers on a flight yesterday saw two small groups of healthy wild horses in unburned areas. No other groups have been observed. 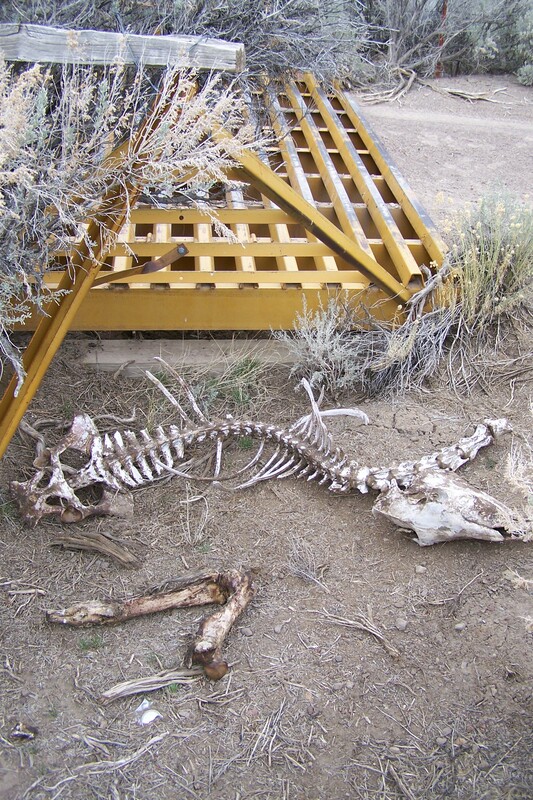 Resource specialists in the BLM Eagle Lake Field Office feel that prior to the fire the horses and burros most likely moved to higher ground as they left dried up water sources for fresh water sources. 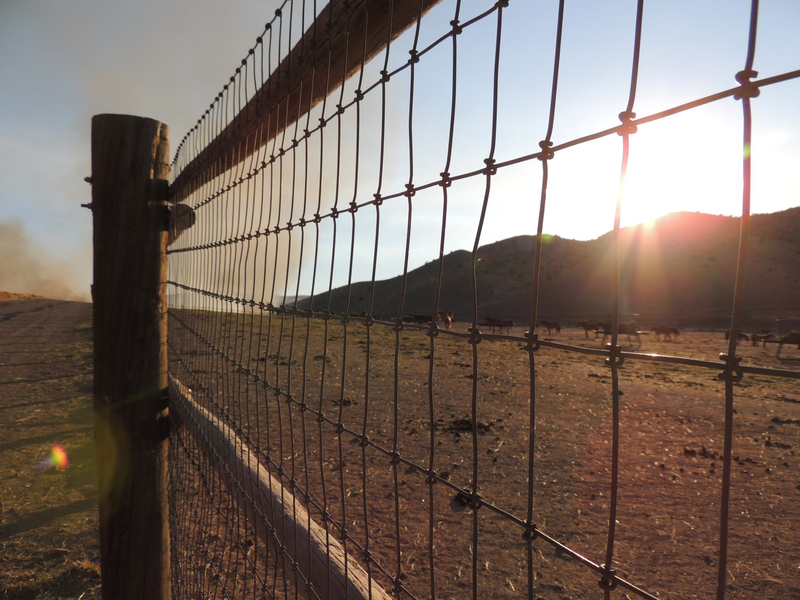 Ranchers have been removing cattle from grazing allotments, and the BLM has directed them to leave gates left open to allow the horses and burros free passage across the range. The BLM has directed fire crews to leave gates open, and shares this message at twice daily briefings with the incident management team. The BLM shares the concerns of those interested in the well-being and safety of wild horses and burros and is taking actions to ensure the animals are able to move throughout the HMA. Public lands in the fire area have been closed to protect public safety. Fire updates and maps are available at www.inciweb.com. 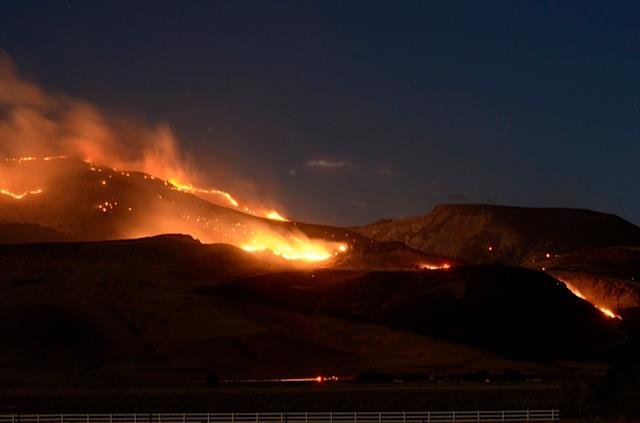 Please send me all the information about the Twin Peaks wildfire and let me know if you are taking fences down so the wild horses and burros can survive by moving out of harm’s way. Location: The fire is located on Bureau of Land Management (BLM), Northern California District (BLM-CA-NOD,) Eagle Lake Field Office, approximately 15 miles southeast of Ravendale, California. The fire is burning near a major natural gas line and transfer station, and power transmission lines that supply the Reno area. Summary: The fire pushed south and east over the top of Skedaddle Mountain as well as spreading east of Observation Peak. Firefighters made good progress to secure the northwestern fire edge. 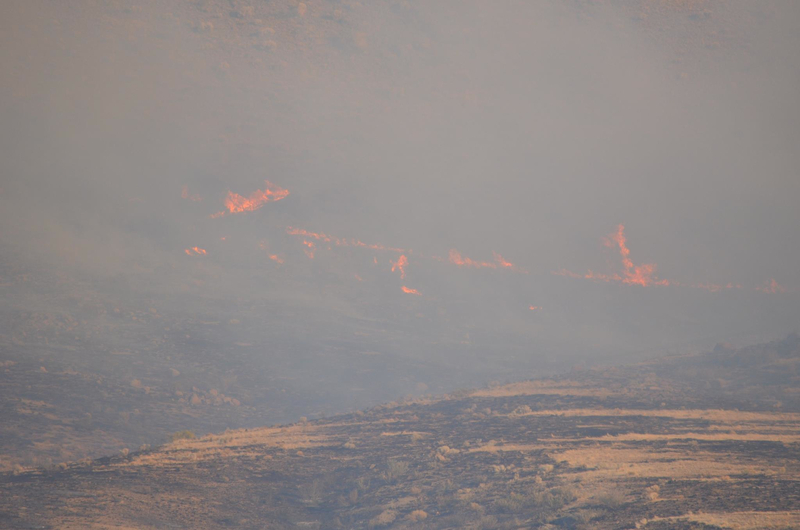 Fire crews will continue to construct handline, dozer lines, and complete burnouts operations as conditions permit in an effort to further contain the fire. Possible thunderstorm activity is in the forecast for the next two-three days. This fire has showed significant growth from thunder cell downdrafts on several occasions. 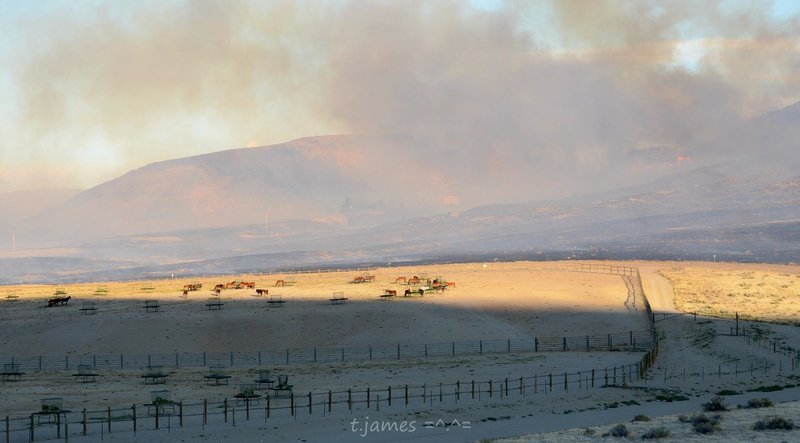 Voluntary evacuations of structures along eastern side of Highway 395. Structure protection is being implemented by fire crews. Residents along Mail Route/County Road 502 and Garate Road were notified that voluntary evacuations for that area are in effect. 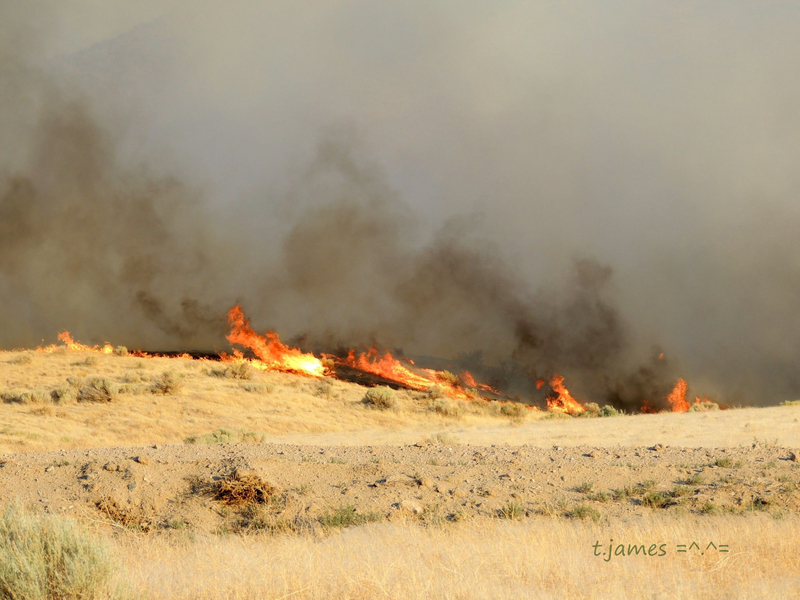 The fire is currently within ½ mile of US Route (Highway) 395. The public needs to be aware for the need of possible intermittent closures of Highway 395 due to fire activity and public safety. Area and Road Closures in Effect: On August 16, the BLM issued a closure order for public lands in the fire area to protect public health and safety. The closed area is bounded by Highway 395 on the west, the Sand Pass Road on the east, and the Wendel Road on the south. The new northern boundary for the public land closure is the Juniper Ridge, Tuledad, Stage Road, Marr Road, and Buckhorn Road extending to Nevada Highway 447 in Washoe County. Routes closed within this closure area include the Ramhorn Springs, Rye Patch Road, Shinn Ranch, Stoney, Deep Cut, Smoke Creek, Skedaddle Ranch, Dry Valley, and Brubeck roads. The Ramhorn Springs Campground also is closed. Travelers along the Highway 395 corridor, please use caution near the fire crews and equipment working in the fire area. 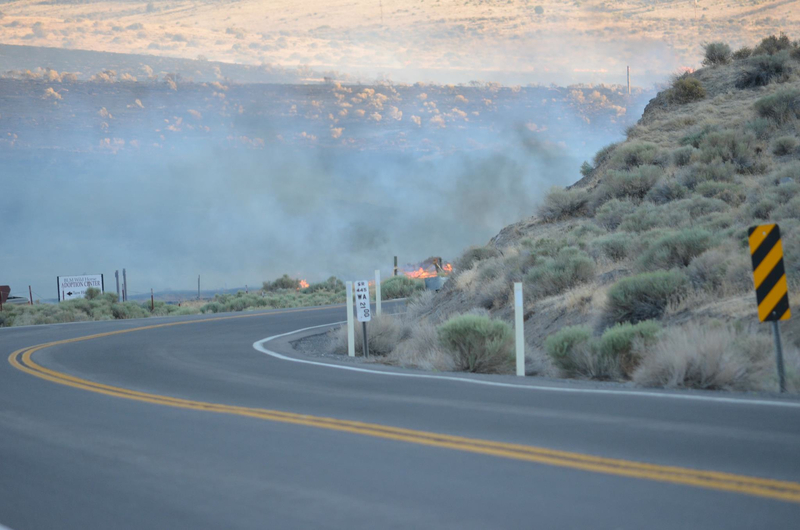 Highway 395 may be closed due to fire activity. Please check for current road conditions with CalTrans at http://www.dot.ca.gov/cgi-bin/roads.cgi or 800-427-7623. For additional fire information, go to InciWeb @ http://inciweb.org/incident/3151/ or follow us on Twitter @ https://twitter.com/NorCalTeam2.